OLD PARKED CARS. : 1969 Citroën ID. My favorite car! But the european version of the front is nicer. Tony, this is more likely a 1965-67 model. 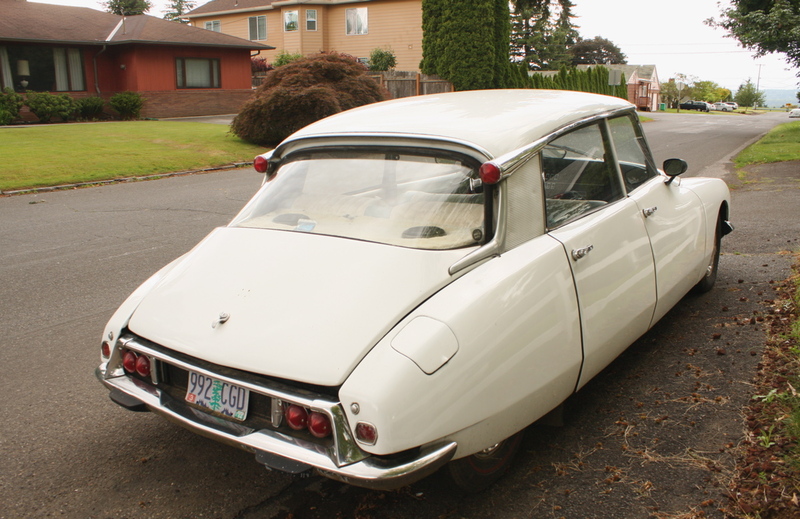 A 1968-72 model for the US market (and the fixed, uncovered headlights make this a US-market car) would have some sort of side marker lights or reflectors, and a '72 (the final year in the US) would have amber turn signals atop the rear window. Amazing how modern the goddess still looks, considering she debuted in 1955. Another great find! The Americans borrowed styling cues from jets and rockets. The French apparently gained inspiration from a street sweeper. thanks, spiff! i edited the title. one of my favorite details about this post is the well kept but tastefully updated midcentury-modern home in the background. what a perfect automotive accessory. Oh, yeah, check out that planter in the front yard! Hmm, white, and extremely "modern". Sound familiar? 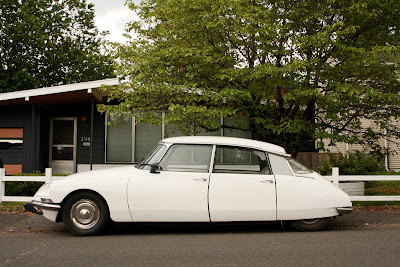 I've always liked DS's, but more for their weirdness. Only recently have I began to appreciate the beauty of this design. Love the long, fluid bullet shape that isn't broken even by the rear wheels. mid-century home in the background - check. very nice combo. probably hipster-consciousness. One of my Dream cars, except I want this with Euro Headlights. So far ahead of other manufacturers at the same era. Magnetic auto leveling suspensions and that steering wheel. so fricken Cool. Never ever see these in Colorado. Actually she's a USA model 1969 ID 19. You can tell by the dashboard, lower seat backs, trim (has wrong high spec Pallas hubcaps); and the lighting is all US regulations. 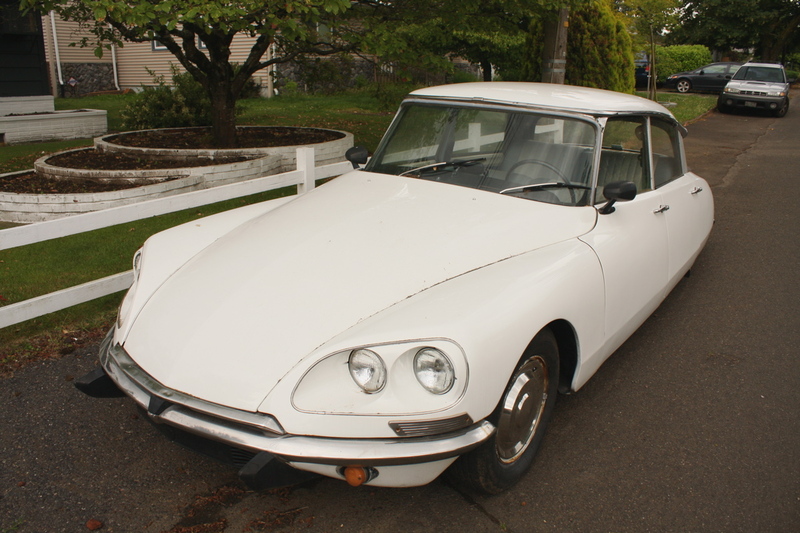 The 'new' 4 headlight front end came in 1968 model year. Still the ugliest car ever produced. What a waste of time, energy, metal, glass, plastic and rubber. If I could I'd buy up every single one in existence just so I could send them through the crusher. Would love to cruise some Autobahn in one of these, isn't the ride quality of that air suspension supposed to be epic? @Eric Wheeler, what think you of the Citroen XM? @greg: thanks for the correction. i've made the edit. Wow! This is Awesome! This is my car! and Yes it's a 1969 ID-19 and yes it does have Pallas hub caps on it. It's my daily driver. I am restoring a 1968 ID-19 too, which is in my garage. I saw you taking pics of it from my living room. Thank You so much for posting! i live just on the other side of 84 and was lurking your car for a while, waiting for the right light and composition. These cars were incredibly ahead of their time- the styling, the pneumatic suspension. Eric W., remember the French helped the US win our independence, sold us roughly 1/3 of the continental US, gave us the Statue of Liberty. It is with penultimate panache and irony that I say "oh- and one more thing....."- Columbo drove a Peugeot! 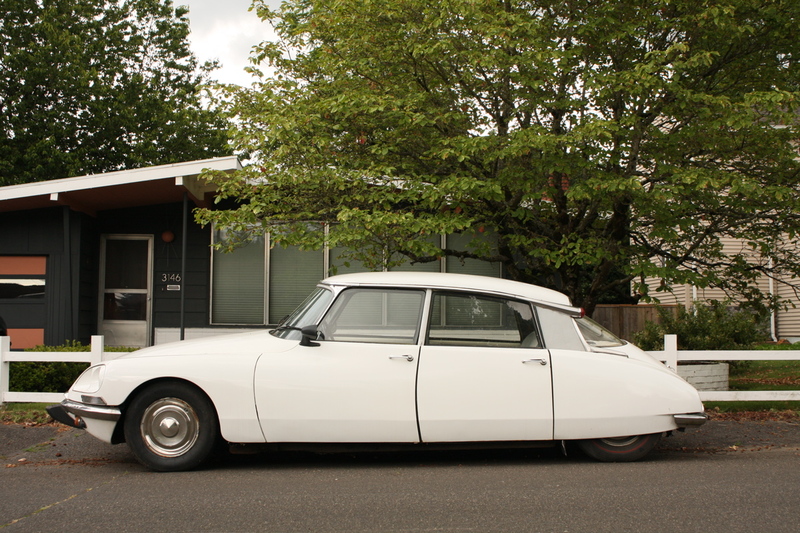 @ Ben: I my opinion every single car Citroen has ever built is ugly as crap and should never have been built. The XM is just an updated, sharp angled and wedgie shaped DS. It looks like a lack & Decker dustbuster. 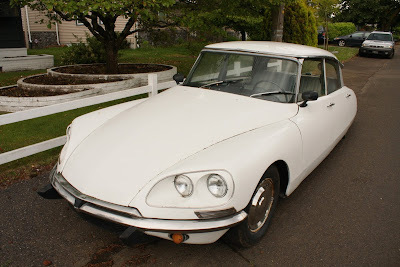 God I hate french cars. when you say I hate French cars you say I know nothing because the brands Delage, Bugatti, Delahaye, Facel-Vega, Voisin Talbot Lago, Hotchkiss, Salmson are among the most beautiful cars in the world ... are French! !